Did you hear? Apple finally caved in and opened up support for 3rd-party keyboard replacements in iOS 8. It's hardly a surprise, then, that Swiftkey's Jon Reynolds and Ben Medlock confirmed the company is already at work on Swiftkey for iOS 8. The two are "delighted" that Apple has finally opened up its mobile platform for 3rd party keyboard replacements. The company is looking forward to adding iOS users to its 200 million user-base. 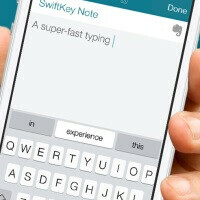 Swiftkey has already made its advances towards iOS by stealthily including its typing technology in the note-taking app Swiftkey Note. It seems the next step is bringing the whole package over to the newly liberated iOS 8. It should be a given that Swift's competitors, such as Swype, SlideIT, and Fleksy, will be directing their efforts towards Apple devices soon. I can sense the sarcasm. Lol! It reminds me the Word flow keyboard from Windows Phone and the swipe feature from Android. You got it backwards my friend. Swiftkey was clearly ripped off by MS and Google! Apple = True iNnovation! What saddens me is the often unenthusiastic outlook developers have for Windows Phone. If this were Microsoft announcing that it is opening its doors to third party keyboard developers, I doubt Swiftkey would already be on top of it. They'd probably halfheartedly dedicate a couple of junior programmers sitting in the corner over there to the task. I'm a Windows Phone user, but this is just the treatment I feel we often get from developers over here -- lower priority and delayed releases. Developers, startups, tech companies, for the most part, hate Microsoft. What do you expect? When developing for Microsoft platforms, everything is proprietary, closed source, has unfriendly licensing, and costs a lot of money. There are some versions of Visual Studio that cost more than a car. Not to mention Microsoft is one of the greatest patent trolls and IP thieves in existence. And that Microsoft was instrumental in destroying America's excellent "first to invent" patent system and replacing it with the sham "first to file". The entire world would be better off without Microsoft and their toxic monopoly of the desktop (windows + office). My daily driver, iUsers are going to love this keyboard. I wonder if it will steal location and password data as much as the Android version. I find it hilarious that this article does not say one thing about swiftkey already on the Android. I find it hilarious you can't read what was implied. "The company is looking forward to adding iOS users to its 200 million user-base." Do you think that it is about 200 million Windows phones? Mr blah sounds about right, laugh. Suddenly, iPhone autocorrects will become far less filthy and accidentally hilarious. Swiftkey is about to make so much money!